Nearly six months ago, I noticed that my desire to live a meaningful life was getting forestalled by many of the petty, day-to-day demands of my possessions. For some unknown reason, I was purchasing anxiety, fitful sleep, and more work at the expense of unnecessary items. I decided to put my materialistic dependency to the test by limiting myself to only 100 “things” for half of a year. I wanted to prove to myself that I had the strength to empty out the rowboat until only life preservers remained. I boxed up clothes, needless decorations, and excess belongings, took them down to a nearby homeless shelter, and said goodbye to a lifestyle of indulgence. From the vantage ground of my voluntary poverty, I learned that most of the luxuries and many of the so-called comforts of life, are not only frivolous and futile, but they are also linked to unnecessary concerns that sap the spirit from our lives. By limiting our possessions, we yield less stuff, but we also produce richer relationships. Never have I been so poor in outward riches, never so rich inward. Now, six months after starting this challenge, I have more space to enjoy at home, more money to bless others, and more time to invest in everything else. Many of us are determined not to live by faith if we can avoid it. The truth is that real faith cannot be bought at a store. We cannot pay money for it. Faith is the means by which we take our incomplete and imperfect lives and do something astounding with them. We cannot use a credit card or even cash for something so wonderful. Remember that nothing in life has any meaning except the meaning you give it. I challenge you to discover the freedom that comes from needing little, and I assure you that you will notice an alleviating emancipation once you are no longer pressured to keep up with the Joneses. If you don’t think you can limit yourself to only 100 things, I dare you to prove yourself wrong from day one. If this challenge is just not for you, as a general rule I encourage you to spend as little as possible and prioritize everyday deeds. As for the future, I plan to keep going in what I am grateful to say is a ridiculously simple and amazing life. Isn’t that all anyone really needs? 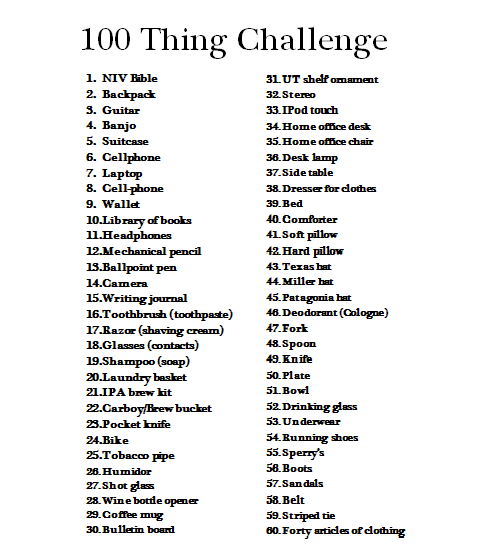 This entry was tagged challenge, freedom, limit, possessions. Bookmark the permalink. Wow I just started reading your blog and am going through personal things in my life right now and was looking for something just like your blog. I think it was a blessing in disguise that I found it, thank you! I would love to read your bucket list!